Michael Eavis has said he wants Noel and Liam Gallagher to reunite Oasis at Glastonbury. The festival boss told the Daily Mirror that he'd love the feuding brothers to perform in the headline slot. 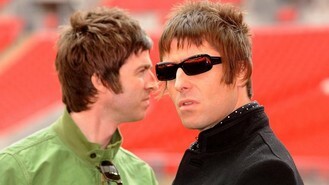 He revealed that he's been talking to Noel and Liam - who announced last month that his latest band Beady Eye had split. Michael said: "I do talk to Noel and Liam a lot. Wouldn't it be marvellous for them to relaunch at Glastonbury, now Liam has split from Beady Eye?" The 79-year-old, who was speaking after being honoured with the Music Industry Trusts (MITS) Award, also said he'd like to book Taylor Swift for the Sunday afternoon slot. "Taylor Swift would be great to follow the Dolly Parton slot - especially being a country singer," he said . But he told the newspaper that it was very unlikely he'd be getting Fleetwood Mac. The US rock band had been the bookies' favourite to headline next summer. Professor Green wants to write a cheerful album. The annual Radio Academy Awards ceremony - one of the most prized events for UK broadcasters - is to be scrapped after more than 30 years. The John Lewis Christmas advert hasn’t had a male voice since 2009, when The Guillemots singer Fyfe Dangerfield warbled through Billy Idol’s ‘She’s Always a Woman’. Fleetwood Mac star Mick Fleetwood has categorically ruled out an appearance at Glastonbury Festival - but said the band will tour again next year.